Insomnia: A combo of genetics and environment? Everyone at some point knows the pain of a sleepless night. For some, though, this is an all too frequent occurrence. Insomnia can be either a problem with initially falling asleep or with waking up in the early morning hours and not being able to fall back to sleep. 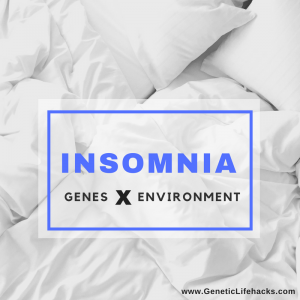 While twin studies and other heritability studies point to genetic variants playing a role in insomnia, there doesn’t seem to be one gene that causes people to get insomnia. It is more complex than that (of course), and studies point to several different genetic variants that perhaps combine with environmental factors (light, diet, stress) to cause those sleepless nights. Below are a few of the genetic variants (covered by 23andMe data) that have been linked to insomnia. This is just a partial picture, though, and more studies are coming out on the topic all the time. GSK3B is a gene associated with both circadian rhythm and mood disorders. A variant of GSK3B, rs334558 (G allele, v4 v5) has been associated in a recent study with an almost doubled risk of severe insomnia in depressed patients. These patients also had a greater insomnia response to antidepressant therapy. [ref] Note that this gene is also acted on by lithium, affecting bipolar disorder. Look at the supplements you are taking to see if they could be disrupting your sleep. Supplements such as lithium orotate (a GSK3B inhibitor which affects the PER circadian rhythm gene) may affect your circadian rhythm. Try varying the time of day that you take supplements to see if it has an effect. Creatine may also affect sleep for some people. Resveratrol also affects circadian rhythm.